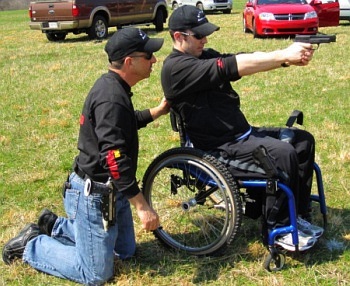 Texas native Trevor Baucom, a former U.S. Army Blackhawk helicopter pilot, has joined the ranks of Team Smith & Wesson as the S&W’s first disabled veteran shooter. At the NRA’s 2011 Annual Meeting, Baucom was introduced as the newest member of the S&W Team. One of Baucom’s first events will be the prestigious NRA Bianchi Cup, scheduled for May 25-29 in Columbia, Missouri. With a distinguished service record of 13 years in the U.S. Army, CW3 Baucom was injured in a helicopter crash while serving his fourth deployment in Afghanistan. The injury, which occurred during a nighttime assault, left the Blackhawk command pilot paralyzed from the waist down. Once back in the USA, Baucom began his rehabilitation in Franklin, TN. There he met Shooting USA host Jim Scoutten, who encouraged Baucom to get involved in competitive shooting. The 31-year-old Vet began training with the goal of competing at the 2011 NRA Nat’l Action Pistol Championship, shooting against able-bodied competitors. While the NRA Bianchi Cup will be Baucom’s first competitive shooting event, the avid hunter and recreational shooter is more focused on enjoying the experience than wondering what his score will be. That said, Baucom is training diligently to improve his X-count. Share the post "Disabled Vet Joins Team Smith & Wesson for Bianchi Cup"
A week before the fall Allegheny Sniper Challenge (ASC), I first saw Adaptive’s Field Density Altitude Compensator (FDAC). I was impressed by its capabilities and compact size and I managed to take one home from the ASC prize table the very next weekend. The FDAC comes from Adaptive Consulting and Training Services in Stafford, VA. The guys at Adaptive know a thing or two about long-range shooting — many of them are former USMC Scout Snipers. Their long-range shooting and combat experience helped them perfect the FDAC. At first glance the $39.95 FDAC appears to be just another data card. However, in a number of ways, it is completely different than traditional data cards. The FDAC was designed to be simple and accurate, so that any military or civilian shooter could pick it up and, within minutes, effectively employ it. Anyone familiar with a Midot Master should find the FDAC simple and intuitive. Another plus is that, unlike electronic gadgets, the FDAC doesn’t need batteries or shielding from the elements. You don’t have to carry around extra batteries, chargers, and “ruggedized” weather-proof cases. 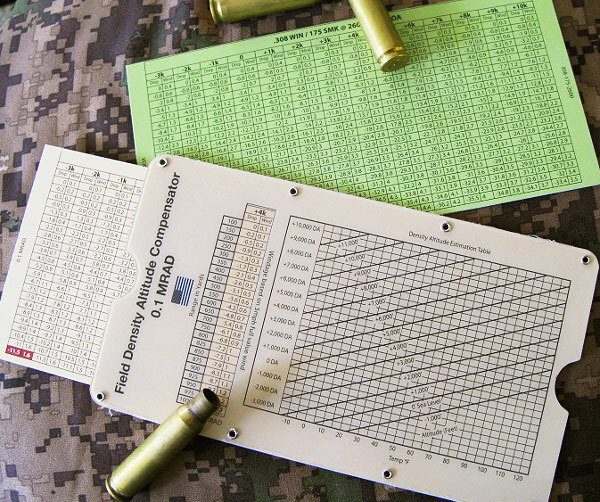 The FDAC is quite different than traditional data cards that calculate trajectories based on a single muzzle velocity in a given set of conditions. The problem with those traditional data cards is that, as soon as one variable changes, the card’s ballistic solution becomes less valid. The FDAC solves this problem by employing several cards for different muzzle velocities and using Density Dltitude to compensate for the differences in environmental conditions. For the uninitiated, Density Altitude combines the temperature, humidity, barometric pressure, and elevation figures into one number that is more easily used over a wider range of conditions. Density Altitude can be obtained with a portable weather station (such as a Kestrel). If a portable weather meter is not available, the basic chart printed on the card itself works pretty well even when guessing at the physical altitude and temperature. I first tested the FDAC at Reade Range in Pennsylvania, shooting from 500 to 1000 yards. I used the 2700 fps velocity card that came with my FDAC for the 175 Sierra Match King since that most closely matched what I had loaded up. Starting out with a cold bore shot from the 500-yard line, I obtained the density altitude using my Brunton ADC Pro, and slid the card over until the proper density altitude column was showing. With 3.2 mils of elevation and .2 mils of left wind dialed into my Nightforce 3.5-15×50 (first focal plane) scope, I went for my cold bore shot, hoping the FDAC would put me close. I was happily rewarded with a first round, center mass hit, just a little left of center. The FDAC continued to shine at longer ranges. FDAC solutions gave me first-round hits at 600 and 800 yards, a second round hit at 1000 yards. Several weeks later I found myself in a field in rural North Carolina once again putting the FDAC to good use this time without any electronic aids. To my surprise, my guestimate of about 500’ for density altitude was pretty darn close to what the Kestrel my friend had was saying also. Just like at Reade Range, the FDAC values delivered cold bore hits that were nearly point of aim = point of impact. That demonstrated how well the FDAC worked in warm weather. This winter I was able to see how the FDAC performed in cold conditions. In cooler, denser air, a bullet requires more elevation correction to get on target than it would need in warmer temps. So I went out one chilly January morning and confirmed that the FDAC can handle cold conditions. The FDAC solutions once again gave me first round hits from 250 yards to 730 yards. The little DA chart put me in the right vicinity for density altitude just by knowing my altitude and making a guess for the air temperature. Since I’ve started using the FDAC I’ve found that the data is either spot on or within about .2 mils of the correct dope at nearly all distances when using the correct density altitude column. This is very impressive. I found that the FDAC delivered practically the same data as popular digital PDAs and field ballistic calculators. But the FDAC can be even faster in use (once you become familiar with its operation), and, at $39.95, it costs a fraction of what a dedicated electronic ballistics solver would cost. The FDAC is practical, very accurate, inexpensive, compact, lightweight and never needs batteries — what’s not to like? Adaptive has put much R&D into the FDAC and it shows. Thousands of Field Density Altitude Compensators have been provided to soldiers and marines, who are making good use of the devices. At the 2011 SHOT Show, Adaptive unveiled an enhanced FDAC, the MILSPEC-XR. This new version includes a new Density Altitude calculator, extended range dope for the .338LM and .300WM, as well as tools for slope dope and moving targets. Adaptive also offers conversion tables and compatibility charts so that the FDAC can be used with other bullets besides the original FDAC default projectiles. (For FDAC owners, the conversion charts are FREE!) The FDAC is truly one of those few products that I wish I had when I was deployed to Afghanistan. I highly recommend it to any long-range shooter using .308 Win, .300WM or .338LM cartridges (with a mil-based optic). For more information, or to order an FDAC tool, visit the Adaptive website, ACTSVirginia.com, or call (540) 657-8541. Share the post "GEAR REVIEW: Field Density Altitude Compensator"